Recapping Dayton Hamvention® 2016, Jim Tiderman, N8IDS, who has served as general chairman of the event for the past 2 years, said attendance this year may have been up slightly from 2015. Tiderman, who now passes the baton to a new general chairman -- Ron Cramer, KD8ENJ -- said he feels the 2016 show, overall, went well. Hamvention 2016 General Chairman Jim Tiderman, N8IDS, appeared on "Amateur Radio Roundtable" in May. "In my humble opinion, it went smoother than we had a right to think it could," Tiderman told ARRL. "The credit for that happening -- this year and last -- goes to our volunteer base and returning committee chairs, who get their talents in gear and go for it." He said each year's innovations feed into the vision that guides the next Hamvention administration, which Cramer will head after serving with Tiderman as assistant general chairman for the past 2 years. Tiderman said that while it's still too soon to get an accurate attendance count for Hamvention 2016, "indicators we use as a matter of course are showing us the slightest increase." He said that while it may not have seemed that way to some visitors, he prefers to keep a positive mind. Official attendance at the 2015 show was 25,621, up by about 750 from the previous year. The weather did provide some momentary excitement, Tiderman said, when a microburst occurred in the flea market just north of the Mendelson's tent. The strong gust of wind took out two or three vendor tents, winding a pop-up tent leg around the fiber cable handling Internet service for the flea market office. "This caused stress and strain on the cable, and down it came," Tiderman recounted. "It did not break, but it did stop activity around the area of the downed cable until the Hara crew got it back into the air. "So, where in other years there have been instances of things erupting 'from below,' this year it came from above," Tiderman quipped. Vendor spaces were nearly full, both inside and outside Hara Arena. Tiderman said the 525 to 530 booth spaces inside were nearly filled to capacity, while first-day occupancy of the 2500 flea market spaces was at 96 percent. Tiderman said he observed an "overall good mood" and "a positive attitude," and the Hamvention staff received many upbeat comments. Read more. An Arizona radio amateur has been unsuccessful in convincing the FCC to take a 1 × 2 vanity call sign away from its present holder and grant it to him. In the process, Joshua Babb, K6FZ, may have learned not to rely on informal advice from FCC staffers. Babb, of Maricopa, Arizona, had been trying to get the initial-suffix call sign W3JB since 2014, and he was briefly successful. The prior holder of W3JB, John K. Birch, had died, and the 2-year waiting period was set to end on August 18, 2014. Babb filed an application for W3JB in July 2014, however, claiming an exemption to the 2-year waiting period on grounds that he was the deceased licensee's nephew, and the FCC granted it. Subsequently pressed to document that relationship, Babb indicated that Birch actually had been his great-great uncle, the FCC recounted in an Order on Reconsideration released on May 25 -- a relationship that did not qualify for an exemption, and the FCC proposed to modify Babb's license by replacing W3JB with KD7HLX. In September 2015, though, Babb filed to swap W3JB for the available K6FZ, which was granted. Under Commission rules, when a call sign is granted in error after the 2-year waiting period ends, it becomes unavailable for 30 days after the erroneous grant is rescinded. Babb sought clarification of the W3JB availability date from an FCC staff member, who calculated that it was November 2, 2015. Babb filed two preference-list applications for W3JB on that date, as well as one on November 3 and another on November 5. W3JB instead went to Scott Phillips of Plano, Texas, who had filed a competing November 3 application, granted through the FCC's "standard lottery process." The FCC staffer later informed Babb that November 3 actually was the correct date. The FCC turned away Babb's subsequent Petition for Reconsideration of the grant to Phillips, saying that its Universal Licensing System (ULS) had processed the applications correctly. "[E]rroneous staff advice is not grounds for reconsideration," the FCC said in its denial Order. "Licensees are obligated to know the Commission's rules. It is well established than an applicant acts on staff advice at his own risk." In any case, the FCC pointed out, Babb did file one application on the correct day. NPOTA statistics through the end of May show that 387,000 contacts have been submitted via Logbook of The World. This comes from nearly 6300 activations by 775 different operators. As of this week, 422 of the 484 eligible NPS units have been activated. Most remaining units are either in Alaska or in urban areas, such as Washington, DC, or New York City. Just as with the DXCC program, the "rarest of the rare" NPS units are showing themselves. It will take considerable planning, logistics, and cooperation with NPS administrators for crafty Activators to put these remaining units on the air. Don't forget! National Trails Day is June 4. If you're looking for an activation, put an NPOTA trail on the air! There will be plenty of trail activations for NPOTA that day, including the big Light Up the Trail event on the North Country National Scenic Trail. Activations will occur from all seven states along the North Country Trail. Check out the Light Up the Trail website for complete information and to sign up as an Activator. A whopping 79 activations are scheduled for June 2-8, including the Minidoka National Historic Site in Idaho, and the Richmond National Battlefield Park in Virginia. Details about these and other upcoming activations can be found on the NPOTA Activations calendar. Keep up with the latest NPOTA news on Facebook. Follow NPOTA on Twitter (@ARRL_NPOTA). The Argentine ÑuSat-1 carrying the LUSEX (LU Satellite Experiment) Amateur Radio U/V linear transponder and 436 MHz beacon launched May 30 at 0317 UTC from China. With ÑuSAT-1 on the launch was sister satellite ÑuSat-2, which carries a 437 MHz beacon. Gunter's Space Page reports that the Argentine ÑuSat Earth-observation satellites form the Aleph-1 constellation developed and operated by Satellogic S.A.
LUSEX is an AMSAT-LU project, and AMSAT-LU reports that both satellites are sending strong telemetry on 70 centimeters. Activation of the U/V Amateur Radio transponder will be announced on the AMSAT Bulletin Board. The transponder, with a 30 kHz bandwidth and transmitting with 250 mW, will have an uplink passband (SSB, CW) at 435.935~435.965 MHz, and a downlink passband at 145.965~145.935 MHZ. CW telemetry will be transmitted on 145.900 MHz. The NuSAT-1 GFSK telemetry beacon is at 436.445 MHz, and the NuSAT-2 GFSK telemetry beacon is at 437.445 MHz. Launch of the geostationary Es'hail-2 satellite into orbit is planned for December 2016. The satellite will be placed in a 25.5° orbit. Coverage of the Amateur Radio narrowband (NB) and wideband (WB) transponders should extend from Brazil to Thailand. Es'hail 2 will carry two "Phase 4" non-inverting Amateur Radio transponders operating in the 2.4 GHz and 10.45 GHz bands. A 250 kHz bandwidth linear transponder is intended for conventional analog operation, and an 8 MHz bandwidth transponder is designed for experimental digital modulation schemes and DVB amateur television. The NB linear transponder will have an uplink at 2400.050-2400.300 MHz, with a downlink at 10,489.550-10,489.800 MHz. The WB digital transponder will uplink at 2401.500-2409.500 MHz and downlink at 10,491.000-10,499.000 MHz. The Amateur Radio on the International Space Station (ARISS) program has announced that 12 schools or organizations that submitted proposals to host an Amateur Radio contact with a member of the ISS crew have moved into the next stage of the selection process. The contacts would take place during the first half of 2017. The 12 semifinalists, in eight states, must now submit an acceptable equipment plan that demonstrates their ability to execute the ham radio contact. Once the ARISS technical team approves the equipment plan, the selected schools/organizations will be scheduled for contacts, matching their availability and flexibility with the scheduling opportunities that NASA can offer. The primary goal of the ARISS program is to engage young people in science, technology, engineering, and math (STEM) activities and to raise their awareness of space exploration, space communication and related areas of study, and career possibilities. We'd like The ARRL Letter to be your first and favorite source of Amateur Radio news. Please let us know how we're doing by completing a short online survey. Thanks! New ARRL Los Angeles SM Diana Feinberg, AI5DF. N6HD, who had announced his resignation from the volunteer post due to time constraints. Greenhut had served since October 2009. When a Section Manager vacancy occurs between elections, the position is filled by appointment. ARRL Field Services and Radiosport Manager Dave Patton, NN1N, consulted with ARRL Southwestern Division Director Richard Norton, N6AA, before making the appointment. Feinberg will complete the current term of office, which extends through September 2017. Feinberg is the president of the Palos Verdes Amateur Radio Club (K6PV), which specializes in public service and emergency communication. She also chairs the Los Angeles Area Council of Amateur Radio Clubs, and she served as the chair of the 2015 HAMCON and the ARRL Southwestern Division Convention. Feinberg is an active DXer and Volunteer Examiner. 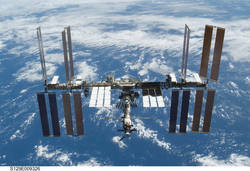 A 2 meter signal from the UK, reflected off the structure of the International Space Station (ISS) on May 2, was heard across the Atlantic. Following 2 weeks of preparation, Tim Fern, G4LOH, in Cornwall (IO70jc), and Roger Sturtevant, VE1SKY, in Nova Scotia (FN74iu) attempted a FSK441 contact. Both stations aimed at the calculated grid HO11nl for a 144.175 MHz contact attempt with a mutual window of less than 1 minute. VE1SKY was able to copy G4LOH at a distance of 4441 kilometers (approximately 2753 miles). This was the first signal received via ISS bounce from Europe to North America, and the first intentional signal heard via ISS reflection in any direction across the North or South Atlantic. While two-way communication did not happen, the reception is being verified as a possible DX record for satellite reflection. Later in May, Fern, operating as GK4LOH and transmitting in CW, was received twice in the much-closer GN37 grid by VO1HP at VO1FN in Newfoundland. In 2014, RSGB VHF Manager John Regnault, G4SWX, received a 2 meter signal from VC1T, where a team was trying to win the Brendan Trophy for the first transatlantic contact on 144 MHz. Upon investigation, it was determined that the VC1T FSK441 signal that G4SWX heard also had bounced off the ISS rather than via terrestrial propagation and would not qualify for the Brendan Trophy, offered by the Irish Radio Transmitters Society (IRTS).The Brendan Trophy will recognize the first "traditional mode" two-way contact (ie, SSB or CW) capable of being copied without machine assistance. CQ magazine announced its 2016 Hall of Fame inductees as Hamvention® 2016 got under way. There are two new inductees to the CQ Contest Hall of Fame, and 21 newcomers to the CQ Amateur Radio Hall of Fame. The CQ Amateur Radio Hall of Fame honors individuals, licensed or not, who have made significant contributions to Amateur Radio, and radio amateurs who have made significant contributions to Amateur Radio, to their professions, or to some other aspect of life. Bob Arnold, N2JEU (SK): Co-developer (with Keith Lamonica, W7DXX, see below) of the first Amateur Radio remote base controlled over the Internet. Grant Bingeman, KM5KG (SK): Developed "method of moments" antenna modeling software for AM broadcast stations and 160 meter amateur antennas. Bob Carpenter, W3OTC (SK): Pioneer of meteor scatter and FM stereo broadcast technology and longtime AMSAT volunteer. David Dary, W5ZAX: Journalist, author, journalism educator, former correspondent for CBS and NBC, journalism professor, author of more than 20 books on the American West. Matt Ettus, N2MJI: Software defined radio pioneer; developed first universal software radio peripheral (USRP) with GNU radio software support. Terry Fox, WB4JFI: Packet radio pioneer; primary developer of AX.25 Amateur Radio packet protocol. Elmer "Bud" Frohardt Jr, W9DY (SK): The original "Elmer," for whom ham radio mentors are named (courtesy of a 1971 QST "How's DX?" column by Rod Newkirk, W9BRD/VA3ZBB). Fred Gissoni, K4JLX (SK): Adaptive technology pioneer; co-developer of the Porta-Braille and Pocket-Braille note-taking devices for the visually impaired and of many other devices. Ken Kellerman, K2AOE: Radio astronomer; pioneer of radio interferometry; co-developer of very long baseline interferometry (VLBI), which permits multiple telescopes to function as a single instrument. Keith Lamonica, W7DXX: Co-developer (with the late Bob Arnold, N2JEU) of the first Amateur Radio remote base controlled over the Internet. George Mitchell, K6ZE (SK): Member of the Tuskegee Airmen in World War II and 2007 recipient of the Congressional Gold Medal for his wartime service. Les Mitchell, G3BHK (SK): Founder of Jamboree on the Air (JOTA), annual event to introduce Amateur Radio to Boy Scouts and guides around the world. William Moerner, WN6I: Co-recipient of the 2014 Nobel Prize in chemistry for his work in high-resolution microscopy. Leigh Orf, KG4ULP: Co-developer of tornado simulator using computer modeling to simulate conditions under which tornadoes form. Joe Rudi, NK7U: Former Major League Baseball player and three-time All-Star. Wes Schum, W9DYV (SK): Co-founder of Central Electronics, which developed the first commercially manufactured Amateur Radio SSB transmitter. Garry Shandling, ex-KQ6KA/KD6OY (SK): Well-known comedian, actor, writer, and television personality. Mason P. Southworth, ex-W1VLH (SK): Head of ARRL International Geophysical Year (IGY) Propagation Research Project in 1958-59; conducted additional research at Stanford. Boris Stepanov, RU3AX (ex-UW3AX): Deputy editor of Radio magazine; computerized contest logging and checking pioneer; developed prototype for World Radiosport Team Championship (WRTC); first to propose combining frequency readout and spectrum scope on transceiver front panel. Rufus Turner, W3LF (SK): Believed to be the first African-American radio amateur in the US; helped to develop 1N34 germanium diode; wrote 1949 article in Radio-Electronics magazine, "Build a Transistor." Perry Williams, W1UED (SK): Longtime ARRL Washington Coordinator and League archivist; helped to convince Congress not to charge amateurs a license application fee, instead arguing convincingly in favor of creating a vanity call sign program; persuaded FCC to retain large amateur microwave allocations and to create a primary amateur allocation at 2.4 GHz. The CQ DX Hall of Fame honors amateurs who excel not only in personal performance as DXers, but who give back to the hobby in outstanding ways. Nigel Jolly, KC3HAE, and the Crew of the R/V Braveheart: Jolly, his crew, and the Braveheart have transported -- and assured the safety of -- many major DXpeditions over the past 15 years, DXpeditions that likely would not have taken place otherwise. Roger Balister, G3KMA: As manager of the Islands on the Air program since 1985, Balister has seen IOTA grow from a few hundred early participants to more than 10,000 today. The Contest Hall of Fame honors amateurs who excel not only in personal performance as contesters, but who give back to the hobby in outstanding ways. Tod Olson, K0TO: Founding editor of National Contest Journal; past ARRL Section Manager, Vice Director, Director, and International Affairs Vice President. Richard Strand, KL7RA (SK): A radio astronomer, he took advantage of the quiet northern latitudes, building and maintaining highly competitive contest stations in a very difficult environment. For many hams, he was their only CQ Zone 1 contact. Formal inductions to the CQ Contest and DX Halls of Fame took place in conjunction with Dayton Hamvention®. Read more. The Don Wallace Museum Foundation (DWMF) is shutting down, as the famous W6AM Rhombic Ranch in Rancho Palos Verdes, California, has been subsumed by residential development. The DWMF has donated $29,000 to the Northern California DX Foundation (NCDXF). "The donation comes with no restrictions or caveats," DWMF Board Chair Joe Locascio, K5KT, said. "As I strongly suspect, Don (the original) W6AM would favor such a donation to an organization dedicated to DXing!" Locascio said the foundation is in the final phase of closing down after nearly 30 years of existence. "The W6AM Radio Club will continue as long as needed to support the W6AM call sign," he noted. Locascio said the Board was making the donation to NCDXF "on behalf of previous donors," who had hoped to see some radio activity at the old W6AM Rhombic Ranch. "Unfortunately, we were not able to achieve our long term goal of an actual museum with an active radio station on the property," Locascio said. A 18 × 24 bronze plaque on a large rock, unveiled in March 2015 and dedicated to the memory of Don Wallace, W6AM, remains at the entry to the Wallace Ranch (see Sept 2015 QST, p 20), where more than 80 homes now sit. Read more. Tim Duffy, K3LR: "While Tim is involved in many facets of Amateur Radio, the Yasme Excellence Award is made in recognition of his adaptation and development of the Contest University (CTU), now in its 10th year," The Yasme Foundation said in announcing his award. "CTU has not only reached hundreds of amateurs around the world, but it has also inspired others to create their own CTU-format training programs in other fields. Tim's dedication to CTU is in the finest traditions of Amateur Radio's self-teaching and training." Duffy is ARRL Western Pennsylvania Section Manager. His award was presented at the Dayton Contest University (CTU) session. Carole Perry, WB2MGP: "The Yasme Excellence Award is made in recognition of Carole's many years of contributions to teaching and mentoring youth interested in Amateur Radio and her efforts in organizing and promoting the interests of young operators," the announcement said. 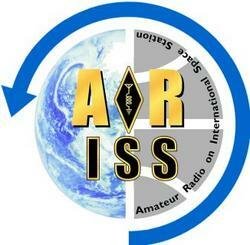 "This youth-oriented work becomes more and more important to Amateur Radio with every passing year. Carole's dedication to this work, including through the Radio Club of America, is in the finest traditions of Amateur Radio's self-teaching and training." Perry's award was presented at Hamvention. Tom Rauch, W8JI: "The Yasme Excellence Award is made in recognition of Tom's many contributions to the technical advancement of the Amateur Service," the announcement said. "Tom's willingness to provide education and direction to amateurs through his website and other communications is a prime example of hams mentoring, teaching, and training each other in the finest traditions of Amateur Radio." Yasme Foundation grants support the Foundation's aim to encourage youth participation in Amateur Radio and operating activities. To support scholarships and youth programs, grants will go to the ARRL Foundation, to fund the Yasme Foundation scholarship and to the Foundation for Amateur Radio (FAR) to support its 2017-2018 scholarship program. A third Yasme Foundation grant made it possible for two young Ethiopian amateurs to take part in the Youth Contesting Program in Estonia. To support HF operating around the world, additional Yasme Foundation supporting grants went to the DX Code of Conduct founder and website operator and to the 2016 Friendship Radio Games. IARU Region 1 reports that young operators participated as "Big Guns" in recent contests from both ES9C, the station of ES5TV in Estonia, and 9A1A, the Croatian DX Club station, as part of the Youth Contesting Program (YCP). All operators are 26 years of age, or younger. The team at ES9C took part in the ARI International DX Contest over the May 7-8 weekend, while the second group at 9A1A operated in the CQ-M International DX contest over the May 14-15 weekend. Some of the young operators at ES9C for the ARI International DX Contest in early May. 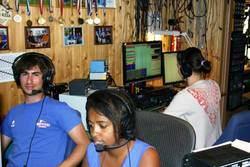 At ES9C were youths from Sweden, Bulgaria, Ethiopia, and Italy, as well as two young Estonian operators and a few older local operators to help the youngsters experience radiosport. At 9A1A in Croatia were a couple of young ops from Hungary as well as several young Croatian hams, and some veteran 9A1A team members to mentor. Tad Cook, K7RA, Seattle, reports: Solar indices barely changed over the past week, with average daily sunspot numbers rising from 25.3 to 33, and the average daily solar flux dropping from 97 to 87.4. The average daily planetary A index rose from 7.1 to 8.9, and the average daily mid-latitude A index rose from 7 to 9. Predicted solar flux for the near term is 85, 80, and 75 on June 2-4; 80 on June 5-17; 85 on June 18-21; 80 on June 22-26; 75 on June 27-July 4, and 80 on July 5-14. Predicted planetary A index is 5, 10, 35, 26, and 14 on June 2-6; 8 on June 7-8; 5 on June 9-10; 12 on June 11-13; 8 on June 14-15; 5, 15, and 10 on June 16-18; 5 on June 19-22; 10, 12, 8, 20, and 12 on June 23-27; 5 on June 28-29; 8, 15, 20, and 15 on June 30-July 3; 5 on July 4-7; 12 on July 8-10, and 8 on July 11-12. A few days ago the predicted solar flux numbers over the 6 weeks dropped significantly. More on this in our Friday bulletin. Sunspot numbers for May 26 through June 1 were 30, 19, 31, 25, 56, 40, and 30, with a mean of 33. The 10.7 centimeter flux was 91.7, 90.4, 87.7, 83, 86.2, 86.6, and 86, with a mean of 87.4. Estimated planetary A indices were 4, 10, 14, 7, 11, 10, and 6, with a mean of 8.9. Estimated mid-latitude A indices were 4, 12, 13, 8, 9, 10, and 7 with a mean of 9.